Joy Joy Kid (Puzzled in the English versions) is not a game with which one becomes immediately accustomed. 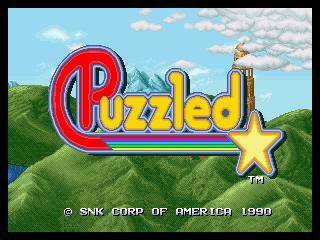 At first, the player assumes that he is dealing with yet another Tetris clone; a miserable experience indeed. 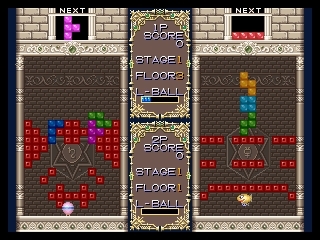 However, Joy Joy Kid utilizes a unique premise, providing a thoroughly entertaining experience to those (such as I) who suffer from the mere mention of Tetris. The presentation of Joy Joy Kid is familiar, the object simple and still fresh even today. 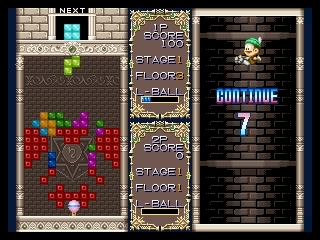 Using a format similar to that of Tetris, this game calls for the player to free a hot air balloon trapped at the bottom of the screen. Thus, the game most resembles “B-Type” Tetris, in that the name of the game is elimination. However, this is where the similarity ends, for Joy Joy Kid does not place an emphasis on total eradication, but rather on selected destruction: The player, at least in theory, needs only to remove blocks which immediately hamper the passage of the balloon. In the early stages, removal does indeed prove to be fairly clean, but as the game progresses, the player quickly faces a jumbled mess. While the game does contain some elements and feel of Tetris, it has a flair all its own. The inclusion of “breakable blocks” (i.e. blocks with portions that disengage upon creation of a line, thereby serving to possibly spawn a chain reaction) was eventually utilized by the Tetris franchise, but not for another 9 years, when it “debuted” in The Next Tetris. The decidedly SNK controls (use the original stick for this one; it’s the archetype of old school) really work well for this title, posing no difficulty in aiding lightning-quick block manipulation. Replay would be greatly enhanced with a memory card, as the game quickly becomes fairly difficult. The ability to pick up a game in its later stages would no doubt prove to be invaluable; playing the game through until victory is achieved is a daunting task indeed.